Everyone and their mother is making weatherproof jerseys nowadays. It really wasn't that long ago that rain resistance was an unheard-of quantity for a jersey. In 2015 you're spoilt for choice, provided that you've got some money to spend, that is. Castelli started the ball rolling, well, it was more of a marketing juggernaut, with their wildly successful Gabba, and over the last few years it's been joined by offerings from Cafe du Cycliste, Giordana, Gore, Craft, Vermarc, Sportful and now British brand Stolen Goat with the Orkaan Race Tech jersey. And this one's a cracker. It's hard to write a review like this without using the Gabba as a reference point, so let's do that. I'm of the opinion that the Gabba's water-resistance has sometimes been overstated. This type of jersey is absolutely not a replacement for a "proper waterproof" if you're riding at a steady pace in heavy rain. But where the Gabba really excels is the aerodynamics - it was designed for Garmin-Cervélo racers, after all. Racers' overriding priority is to go fast. If they can keep fairly dry as well it's a bonus, but the reason why they moved from lightweight waterproof jackets to this sort of top isn't because it kept them drier. 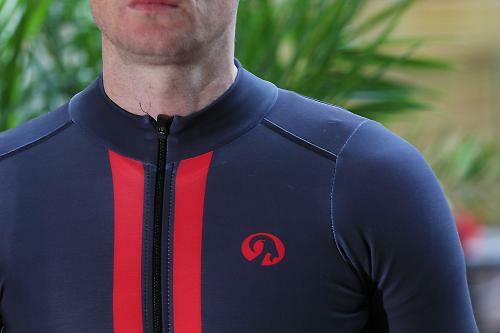 Designed with a fairly uncompromising eye on aerodynamics, the Orkaan Race Tech jersey is about the most skin-tight jersey I've tested since the Aero Race. The sizing guide on Stolen Goat's website is accurate, provided you want to cheat the wind, and there's a decent range of sizes for chests between 34in and 47in. It's not really a jersey that you'd wear down the pub after that damp 10 mile TT, but you might have figured that out already. I'm relatively tall and skinny and the medium was a close but comfortable fit, without any loose fabric at all. (Mat in the pictures is a similar height and weight to me.) The sleeves are fashionably long, down to the crook of the elbow, and have raw-cut seamless ends like those that we liked so much in their summer jerseys. The torso is longer at the back as you'd expect, and at the front it rises slightly to the bottom of the zip. Stolen Goat are keeping quiet about exactly what fabric is used in the Orkaan jersey, but it's pretty impressive stuff. Stretchy enough to allow for the skin-tight fit, yet still offering better protection from the rain than most of the other similar water-resistant fabrics I've tried. In my tests, I found it lets in less water than the Gabba, Castelli Nanoflex and Giordana G-Shield fabrics. Like those competitors, the seams are the area most susceptible to moisture ingress, and a little bit of water does get in here, but it's really not much. One Saturday I waited until the forecast rain arrived - a strange inversion of the norm - before heading out for a relatively quick two hour blast wearing this jersey over a base layer. The rain was my constant companion and the main roads of my route made for no shortage of road spray too. On returning home, my torso was basically still dry. A careful inspection of the base layer showed some moisture around the shoulders where the seams of the jersey sit, and a little behind the zip, but that's about it. Stolen Goat use the same fabric in their matching skull-cap, and head honcho Tim has made a video showing how the fabric copes with water. It's pretty impressive. I tried the same thing to check that they hadn't cheated with Neverwet spray and got the same results - you can pool water on the fabric for quite a while and it just runs off leaving the surface dry. Interestingly, if you wear it under a relatively powerful shower, the water gets through almost instantly; the extra pressure is enough to overcome the hydrophobic surface. I'd assume, therefore, that under a monsoon-style downpour you'd see the same thing. Happily, unless you live a lot closer to the equator than I do, rain generally doesn't approach the pressure of a power shower. A close inspection of the fabric shows it's really quite different stuff to the Gore Windstopper X-Lite Plus used in the Gabba. For one thing it's fleecy on the inside, unlike a Gabba, so it feels significantly nicer against the skin if you're riding without a base layer. If you're riding in persistent enough rain to overcome the Gabba's defences, I find it can be a bit clammy (at least without a good base layer), unlike this jersey. This fabric is really stretchy, around twice as stretchy as Gore Windstopper X-Lite Plus. It's also much more breathable. It's not a total wind-blocker but the protection is nevertheless pretty good, surprisingly so given how breathable it is. Stolen Goat reckon that you can use this between 5 and 18 degrees, which is probably about right (provided that you've got appropriate base layers and arm warmers for the colder end of that range). We've not had 18 degrees during the test period, but it's seen plenty of use for high-intensity riding like chaingangs when the temperature is down in single figures. If you're more of a potterer, it's probably not the jersey for you, and in any case you'll want more layers to stay warm. 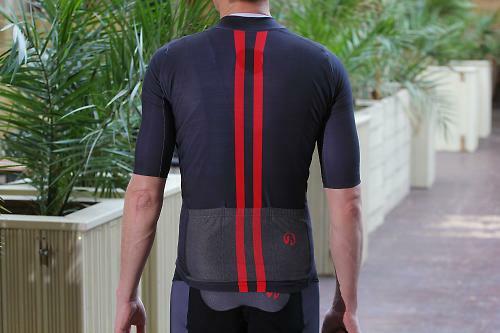 The standard three rear pockets are made from the clever reflective material used on the Climb and Conquer jacket, meaning that night-time visibility to cars is excellent, at least from the rear. Styling is simple but nicely executed - a pair of red stripes front and rear adding some contrast. There's a version with green stripes available too. Branding is kept to a minimum, with just a small logo on the right hand pocket. Standards of construction are good - there's a mixture of flatlock and regular seams which are mostly tidy, although I had to trim a few loose threads. There's no silicone gripper strip around the waist, but it fits so snugly that this isn't really needed. The zip is a good quality YKK cam-lock one, although without the windflap which helps keep out drafts and drips on a Gabba. The Gabba's excellent stashable bum flap is another detail I missed, not least as racers don't generally use mudguards. As I mentioned at the top, weatherproof jerseys are still fairly expensive, typically £100-£150 for a short-sleeve. The Orkaan is towards the lower end of this price range, which is good news as I think it's one of the best performance options available. Revolution is a word that is somewhat overused. But in terms of high tech cycling garments – this aero short sleeve, water repellent, wind proof, reflective, breathable jersey is a genuine candidate. The stolen goat Orkaan Race Tech ss cycling jersey is the solution for... weather! You want to ride or race quickly, efficiently, comfortably... with style – what you don't want is to worry about the rain, wind or overheating. Designed for temperatures ranging between 5-18 degrees the jersey is constructed from a water repellent fabric that is also wind proof. A soft, thermal, brushed lining keeps you warm but the breathable nature of the fabric means you don't overheat. This is a genuine 3 season jersey, in the UK I may even wear mine in the summer on some days! The rear pockets feature the Pixel 100 reflective fabric for extra visibility and safety even in low light conditions. The arms have a modern raw cut, aero finish. The fabric is supportive to optimise your performance further. Despite being stretchier than most competitors, the Orkaan somehow manages to keep you drier; deeply impressive. The fit is a racer's dream - it's designed for going fast. No issues during testing, and Stolen Goat say that the water-resistance comes from fibres woven into the fabric rather than a DWR treatment applied later, so it shouldn't wear off. Priced lower than most competitors (with Vermarc being the only exception I could find) yet out-performs the market-leader. Aero fit, cosy brushed inner, and seriously impressive water-resistance. The Jersey is a really tight fit. It's also much more breathable. It's not a total wind-blocker but the protection is nevertheless pretty good, surprisingly so given how breathable it is. That's a fine looking jacket and will surely find a place in my wardrobe. I do, however, love my Gabba for it's wind stopping powers and in the recent icy windy weather it has been a godsend. This could be great for warmer, wetter days. It's got go-faster stripes too. It's a bit idiotic but I will never buy a single product from this brand because of the awful name. Really poor branding. Seems a shame when the product is top notch. So nowhere on the top is the name of the brand, just a small subtle logo of a goats head. If you want people to pay top dollar for a premium product then you need to brand accordingly. How many people would buy a Rolls Royce if the brand was actually called Rusty Donkey? Interesting as I think that Vulpine is a shite name, yet it hasn't stopped me from buying one of their jacket. For me, I'll never knowingly buy Specialized and am unlikely to buy Rapha for other brand associated reasons. We all apply our own reasons for buying any particular reason for buying any given brand. There is no right or wrong. Horses for courses. Not quite sure the names Rapha, Assos or Vulpine evoke 'European style/heritage' on name alone. 'Cafe du cycliste' maybe... but even that sounds more like a beverage. As a name 'Stolen Goat' sound a bit more 'individual, off-beat and quirky' which I suspect will go down well with many cyclists. I would'n want to go around in cloths which have 'Stolen Goat' plastered across them - but understand that this company doesn't put their name on them, just a small logo. So what's the harm? Firstly - we don't want people to pay "top dollar" for a premium product... we want them to pay a reasonable price for a premium product. This has been our pricing strategy from the start and hence why this jersey is some 30% less expensive than the competition. I think that the day we all decide to follow the convention in naming a company will be a very dull day indeed. Evoking heritage is great... but essentially you are merely evoking... you have no basis as you are brand spanking new. I'd much rather be honest about our size and "newness". That said, it isn't for everybody, some folk get it, some... not so much. I can live with that if you can. We aren't trying to offend, merely bring a little fun to the industry. Personally I think the name is grand - proper silly and a bit of a laugh - and I look forward to trying some of their stuff. 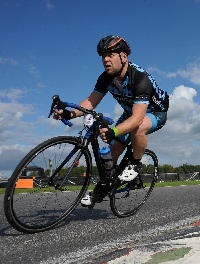 I also think Sportful and Pactimo are slightly naff names but I love their stuff, and between the two of them account for most of the kit I have. Hey ho, whatever floats your boat. If only you had called yourselves 'Purloined Hircine'. Great clothes, terrible name, even worse logo. Shame. I like to think that it's inspired by the Clutch lyric 'in the wake of the swollen goat'. "Goat" is great, far better than the faux francais approach, see "Chappeau" or "Etape". The logo is nice. Goats are hardy, goats climb mountains in all weathers. "Stolen Goat" is a comedy tie, it's a "Plain Lazy" t-shirt, a "Weird Fish" jacket and an "old guys rule" hat. I would like some transparency over the magic water defeating material it is made of. With Gore, Castelli, Sporful etc, you know exactly what you are getting, Windstopper. Gore-Tex, Polartec Alpha etc, but with this you don't. Is it a coating? If it is will it survive several washes? If I buy it now will it work 6 months from now? Stolen Goat aren't unique here, most of Rapha's outerwear is suitably coy about what it is, and I see Vulpine are suitably opaque with their new Gill jacket. Outdoor wear such as Montane and Rab are totally clear about what you are buying; I disapprove of newer cycle "apparel" makers with exclusive materials, or waterproof and highly breathable membranes that they won't name. You could always try asking Tim from Stolen Goat if he's willing to clarify - although clearly there may be commercial confidentially issues which prevent that. "This is no spray-on treatment that fades with washing. The textile has undergone a treatment during the weaving process in which special threads are woven in that create a physical barrier from water. Because it is woven in, rather than a coating applied on top, these features are permanent, even after repeated use and washing." That is a lot of fabric options! Whatever you choose to call them its either a type of DWR, or a PU membrane, or an ePTFE membrane, or the weave, or minority things like encapsulated fibres. Why don't you just ask ? Really like the look of the jersey and love the colour but, please do one without the stripes (which seems at complete odds with the rest of the collection) and my money is yours. Why compare with the Gabba? The Gabba is designed to be worn OVER a jersey, they are close fitting but easily removable. As great as the SG jersey might be for an hours wet crit or cross race, I don't think id fancy my chances of putting this on mid race nor would i like to ride or race for 6 hours in sleet and snow in just this especially as its not windproof and driven rain (say like riding fast down a mountain) will come through. So where is the comparison? This is a jersey to be worn for short wet races the Gabba is effectively a close fitting soft-shell jersey for putting on and taking off mid race-for extra protection without the flapping of a rain cape. Its a shame your reviewer doesn't know his onions. The Gabba has a form fit and 3 rear pockets while you can get a thermal base layer on under the Gabba 2 you will struggle to squeeze much more in. if you ride in milder wet winter conditions especially shorter higher intensity rides the Gabba is perfect you wont need a shell and you will also get dry weather use from it on cool dry days. Goodness, there are some right misery guts on this thread ! For me the Jersey looks very nice but a little odd shaped (although to be fair it could be the tester?) - I'd personally be sold if it had a longer tail, it looks a little short and what's more annoying than a wet patch of spray on your lower back.